Give your Sleuth the Props they deserve. Tired of Sleuthing away in obscurity? Afraid that the world will never appreciate the great lengths to which you have gone to save it? Whether your greatest accomplishment is capturing a legion of the dastardly villains, or just helping out the Imperial Librarian with a few overdue books, make sure the Sleuth World knows by earning and displaying a new Title achievement. 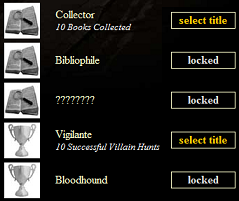 You can select which of your earned Titles you wish to display from your Detective page.